The remote Yingxin Township, home to just over 1,400 people, sits 100 kilometers from downtown Mianyang City, Sichuan Province. Yingxin Township School is the only school there. Over 70 percent of its 328 students are "left-behind children," a term that describes those in rural areas usually living with grandparents because their parents have gone to work in cities. The school is nicknamed "farm yard school" by locals as it is in the middle of a farmland. And from these farmlands comes the story of a group of left-behind children becoming the runners-up in this year's national U12 5-a-side football tournament. Around 11:10 a.m., as the recess bell rings, 6th grader Shang Guolin, along with a few other boys, rush across the school's concrete playground into the sports gear room to fetch a dozen footballs. Then Shang, his team's centre forward, starts practicing by kicking the balls against the wall that separates the schoolyard and farmland. When the ball flies over, he has to crawl through a hole to go find it. At coach Ma Shunxi's whistle the formal training session starts, where the children learn about tactics and build up their strength by dragging used tyres. One hour later, the boys break for lunch and wait for their sweat-drenched shirts to dry. "We had a football team before 2008. Back then we only had a mud yard," said Ma, who is also the school's vice-principal. "But Wenchuan Earthquake destroyed the school. In 2013, we had a 50 meter by 28 meter concrete yard and bought 100 footballs. We still don't have grass but it's much better than before." Principal Gao Xiaoqing said, "many of our students grew up without their parents being around, and they tended to be shy and reserved. Playing football changed that." In 2016, the team competed in Anzhou District and then Mianyang to finally earn the opportunity to represent the city in the finals of the national U12 5-a-side football tournament in January 2017. Ma took his 2 teams of 30 boys and 18 girls - the youngest being 8 and oldest only 12 - by bus and then coach to the venue almost 400 kilometers away. When they finally arrived, the envious looks on the kids' faces on first seeing a real grass pitch and the professional gear of other teams got Ma a bit emotional. "January was cold. The other teams had proper winter gear while we only had shirts for summer." But Ma knew how to encourage his players. "It's not about what you wear. It's about how you play." This seemed to have worked. From January 19th to 22nd, Ma's boys went on to win 2nd place, and the girls won 5th place in the tournament. Shang Guolin, one of Ma's players, was named the tournament's Best Player. The news sent the village into "hysteria," Gao recalls. "A restaurant made a big red banner for the kids and waited for them to come home until midnight. The kids were so excited, taking turns to hold the trophy." She went on to say that "so much has changed since the kids started playing football. They are much more outgoing now." The 12-year-old Shang Guolin has since been offered a place at a renowned middle school in Mianyang. This school usually only takes 1 in 100 students from his school. It has better facilities there, including a real grass pitch. 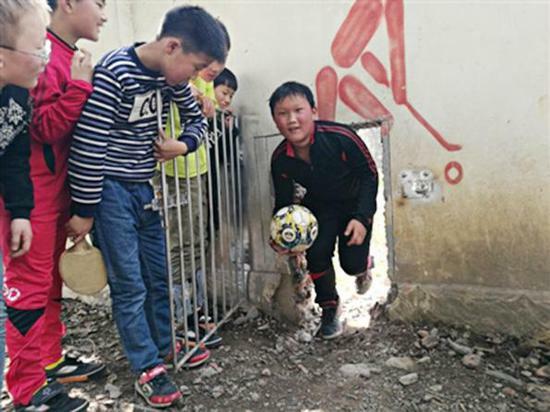 A group of left-behind children found joy and success on the football pitch.